While today may not be THE day, it is a BIG day. I’m waiting for UPS to drop off my first shipment of yarn and find myself looking out the window every few minutes to see if the truck is out there. The dogs aren’t barking but yesterday, or the day before, they let the mail lady park in front of the house and honk her horn without a peep until I started down the stairs – then they wouldn’t shut up. My new business cards were in the mail today. Nate designed them and they turned out pretty darn good. I did receive my business cards today! Nate designed them, using my logo and I think they turned out great! My biggest concern right now is brand identity. I have the Propanicus Moon name playing off of Propanicus – bitter cold winter, empty propane tank lasts 2 weeks, now it’s a giant party in February with fried turkeys, spicy food, gifts of warmth, tiki torches, glow in the dark bocce, and, last year, a fire juggler. 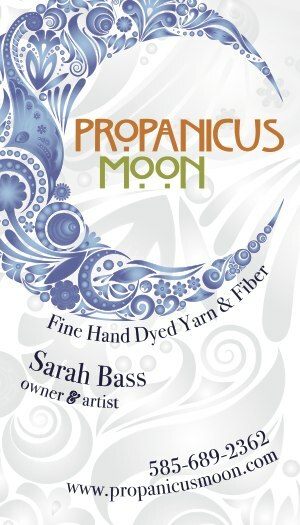 How does this transfer into the name/theme of a yarn company? My only connection is the gifts of warmth aspect with me making dozens, over the years, of hats and scarves and fingerless gloves. The idea that sparked (ha, ha) the bigger concept was watching lightning during a thunder storm. I’d wanted a way to combine art and knitting into a way to make some money and this seemed like a great way to do that. I’d better post this now so I can move on to things that are happening.